Dale C. Svingen, 89, Fargo, ND passed away on Sunday, September 15, 2013 at Riverview Place in Fargo. The Mass of Christian Burial will be on Thursday, September 19 at 10:00 AM at St. John's Catholic Church, Wahpeton, ND. Visitation will be on Wednesday at the Riverview Place Chapel, Fargo from 6:00 PM to 7:00 PM with a 7:00 PM Prayer Vigil. There will also be visitation one hour prior to Mass at the church. Interment will be at Calvary Cemetery, Wahpeton, ND. Arrangements are entrusted to Vertin-Munson Funeral Home, Wahpeton. 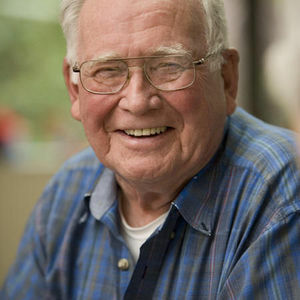 Dale was born on April 30, 1924 to Peter and Stella (Jones) Svingen in Bottineau, ND. He grew up in Overly, ND and graduated from Overly High School in 1942. Dale enlisted in the US Marine Corps on April 28, 1944 and served on the USS Minneapolis in the Pacific as Captain's Orderly and member of the Marine Security Detachment. He was honorably discharged on April 2, 1946. He returned to North Dakota, attended the North Dakota State School of Science in Wahpeton and received a degree in electrical engineering. Dale was united in marriage to Margaret "Betty" Dietz on December 27, 1950 at St. John's Catholic Church in Wahpeton. They lived in various communities while Dale was stringing telephone wire around the tri-state area. They then moved to Steele, ND in 1957, where Dale became the Plant Manager and later General Manager of BEK Telephone. In 1978, they moved to Hazen, ND where he served as Manager of West River Telephone until he retired in 1989. In 2006, Dale and Betty moved to Riverview Place, in Fargo, ND. Dale was a natural and skilled leader and served in many capacities including numerous years as Steele School Board President and as a 4th degree Knight in the Knights of Columbus. Along with his community leadership positions, Dale also served as President of the North Dakota Telephone Association for two years. Dale's legacy includes his service to God through the Catholic Church, to country through the Marine Corps, and to his community through volunteer work and a long list of service organizations. He was devoted to his children, grandchildren, and great-grandchildren. Dale worked with his sons to restore his own father's 1925 Model T truck. He loved to dance, especially with his one true love, Betty. He enjoyed music, gardening, woodworking, playing cards, golfing and shooting pool. Dale was generous, loving, and compassionate with his friends and family. He used his computer to share stories, bits of wisdom and life lessons with his grandchildren and others. Check out his YouTube videos!!! For fourteen years after retirement, Dale and Betty spent the winter months in Harlingen, TX and made many good friends. They also enjoyed attending USS Minneapolis Marine Corps detachment reunions. Dale was selected to be on the first Honor Flight from Fargo to visit the WW II Memorial and National Museum of the Marine Corps in Washington, D.C. Dale is survived by his beloved wife of more than 62 years, Betty, Fargo, ND; his children, Peder (Susan Barton), Duluth, MN; Paul (Suzann) Mt. Horeb, WI and their children Scotti, Justin (Adrienne), and Davis (Anna); David (Julianne) Omaha, NE and their children, Eric, Kyle, and Leah; Dyan (Chuck) Summers, Fargo, ND and their children, Kellen and Riley; Daniel (Ila), Bismarck, ND and their children, Emily and Elena; Donna (David) Lite, Overland Park, KS and their children, Evan and Ryan; and his four great-grandchildren, Macy, RaeLynn, Ada, and Stella. Dale was preceded in death by his parents; his sister, Genevieve Whitfield, Sacramento, CA; and his brother, John L. Swingen, Rocky Hill, CT. In lieu of flowers or other gifts, the Svingen family prefers donations to The Nature Conservancy of North Dakota or St. John's Catholic Church in Wahpeton. My thoughts and prayers are with all of you. I am filled with wonderful memories of your father. There will never be a more cheerful, kind, and social man. I was blessed to grow up with Dale & Betty as our neighbors. I will always think of Dale when I visit Hazen and hear the birds in the trees he planted near the creek behind our homes on Sunrise Drive. Dale and I (Leo) shared childhoods during the tough years of the thirty's, which we nevertheless enjoyed, in the little town of Overly, ND. To both of us those were good years!We extend our sympathies to the family and the many others who loved and enjoyed this good man who we now know is receiving his reward. God bless you all! We are sorry for your loss. Dale was a great guy. Our prayers are with you. Deepest sympathy and prayers to all of you. Have many memories of Dale and your families while in Steele. Thanked God many times at mass when he was able to be the reader and I was taken off the hook to be the reader that Sunday. Thank goodness I was allowed to read and not have to sing. Many years have now passed but you are in my thoughts and prayers during this time. Deepest sympathy and prayers to all of you. Have many memories of Dale and your families while in Steele. Thanked God many times at mass when he was able to be the reader and I was taken off the hook to be the reader that Sunday. Thank goodness I was allowed to read and not have to sing. Many years have now passed but you are in my thoughts and prayers during this time. David has met my son Scott in Omaha at some engineering meetings that they were at. It is indeed a small world. Svingen family, my heart goes out to you at this time. Please know that you are all in my thoughts and prayers. Dale truly was a great person and a great boss. I loved working with him and was saddened when he moved on. May the memories each of you holds so dear, carry you through this difficult time. ber his laugh when Dyan & I did something he thought more often than not was funny. Hold your memories close & know he will be so very missed.